As drought bites in Australia and politicians obfuscate the underlying issues, farmer and author Charles Massy reveals his vision for a resilient agriculture that not only acknowledges climate change, but works to prevent it. Examine each question in terms of what is ethically and aesthetically right, as well as what is economically expedient. A thing is right when it tends to preserve the integrity, stability and beauty of the biotic community. It is wrong when it tends otherwise. Charles Massy is a storyteller. He invokes the spirit of the early environmentalists in adopting Samuel Taylor Coleridge’s famous “Water, Water Everywhere…[nor any drop to drink]” as the title of Chapter Seven of his book Call of the Reed Warbler: A New Agriculture, A New Earth. In the opening paragraph, Massy evocatively draws the relationship between the bodily experience of water and the concept of water at a larger scale, drawing us into the physicality of a perhaps otherwise abstract notion. Taking this invocation further, he opens the chapter with an arresting quote from Aldo Leopold’s A Sand County Almanac, a quote that aligns the preservation of the biotic community with concepts of ethical and aesthetic ‘rightness’. Leopold sets this notion in counterweight to economic expediency – expediency being concerned with the delivery of practical outcomes despite the possibility of those outcomes being immoral, improper (not ‘right’) or even perhaps unethical. Themes emerging from Chapter Seven of Massy’s book underpinned a recent conversation I had with the author, wherein we discussed the relationships between broad issues of landscape and current political and social discourse. For Massy, the inseparability of water and landscape is a given. He notes that many of the large scale issues of landscape degradation that we currently face are water related – including, of course, drought. He sees the widespread adoption of a “mechanical mind” approach to agriculture and land management as the root cause of these issues. In Massy’s reading, this approach both engenders and is predicated upon our disconnection from the landscape and from processes both human and non-human, including food production. By way of reference, Massy points to the ‘Fertile Crescent’ of the Middle East, particularly the valleys of the Tigris and Euphrates, noting that Plato was writing of desertification as agricultural methods desiccated the landscape. The similarities between this history and our current situation are striking. In our discussion, Massy observed that “the Australian landscape was hydrated before European settlement” and that “the adoption of European agricultural techniques has led to the draining of the landscape and destruction of the small water cycle” – broadly speaking, localised processes of evapotranspiration. He proposes instead an approach to agriculture which is regenerative – regenerating landscape systems as well as cultural and social systems at all scales, including the personal. 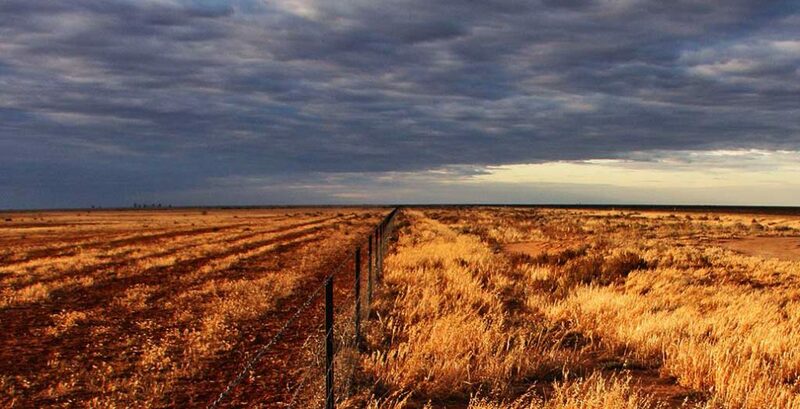 Massy points to many instances in Australia where our interference with the small water cycle has contributed to the drying of the landscape, from drainage to deforestation, overstocking to poor crop and stock rotation management. Increasing carbon emissions then exacerbate impacts through the large water cycle. He cites many examples in his book of landscapes in which mists and fogs were once integral elements, including the now dry Buckleys Lake near Jindabyne in New South Wales, where once brolgas and myriad other water birds cavorted and flourished. Morrison’s perspective isn’t shared by all of the parties affected by the dire lack of rainfall in the region. The same Guardian article quoted Longreach sheep and cattle farmer Jody Brown as saying, “I think no matter where you stand or what your perspective is, droughts are part of a climate and you can’t separate those two issues.” Similarly, in a 2017 Guardian piece on the slow death of the Darling River, Barkandji Elder Uncle Badger Bates wrote, “When they take the water from a Barkandji person, they take our blood. They’re killing us. It’s not just us Barkandji people who are feeling it. It’s the white people and other people too.” These are not issues for another day. While alert to the febrile nihilism that characterises much current political environmental discourse (discourse often underpinned by expediency), Massy remains optimistic. He points to the role of advocacy through truthful story-telling in tackling these issues. Massy draws on the work of Paul Hawken and his recent book Drawdown to highlight the fact that stories of environmental doom will not galvanise the vast majority of people to action. It can only be galvanised through regenerating human connections to landscape – the story must be told. Massy is a storyteller. While he acknowledges the reality of landscape degradation at the broad scale, his writing and conversation are peppered with evocative, localised stories of the landscape – bird song on a hot afternoon, running water on one’s skin, the astonishing beauty of a frosty morning and of the mists and fogs that once rose from lakes and swamps in a hydrated landscape. In doing so, he seeks to regenerate our connection to landscape. …we need to articulate a more cohesive and unified vision, one that understands the crucial importance of truth-telling, together with a fundamental paradox: that acknowledging the past – or, more specifically, what the poet Judith Wright called ‘the attitudes that helped us to conquer and settle this country’– will not weigh us down. It will liberate us. This applies as much to Indigenous as it does to other Australians. Jock Gilbert is a registered landscape architect and academic in the School of Architecture and Urban Design at RMIT University. His practice focusses on community engagement and Indigenous-led research. He is active in a growing national and international discourse around the role of design in reconciliation, particularly through engagement with Traditional Owners and Indigenous Knowledge-holders.